A limo bus in Toronto can be rented for a variety of reasons and special events, from group travel to weddings. As luxurious as the timeless stretch limos are, they can only hold ten to twelve people. For larger groups, companies such as Majestic Limos offer party buses. They come in varying sizes in rates. A smaller bus can hold 20-25 people, and a larger one can hold twice as many. The deluxe sized limo buses even come with catering services and bars! When booking your bus, you can arrange for it to come equipped with your choice of beverage(s), music, lighting, etc. Event coordination and arrangements are services offered by some rental companies. Whether it’s for business, entertainment, sightseeing, or any other purpose, limo buses offer everything you need to travel in style. However, it should be noted that not all rental companies are equal, and if you don’t choose the right services, your party or event could turn into a disaster. Make sure you rent from a company that has its vehicles inspected on a regular basis. Inquire about routine cleaning and servicing. It’s not a good idea to go through a third party, either, since there is no guarantee that the bus selected for you will be in top condition. Only go with a company that owns and maintains its own buses. Even if you have a small group, you can still enjoy the benefits of a large party bus. There will be extra room for everyone, making it easier to celebrate. These vehicles are also ideal for people who are not familiar with Toronto traffic. If you and your family or friends want to see all of the best sites in the city, you can do so privately in a limo bus. Why bother with a regular tourism bus, where you will be stuck with a bunch of strangers? Since you won’t be driving, you can enjoy all of the wine or champagne you want. Just request your preferred drinks during the booking process. Some drinks may even be complimentary and part of the package, so be sure to ask about that. In short, these vehicles are ready entertainment that provide an ideal environment for any type of celebration or party. You might even be able to get a DJ upon request. 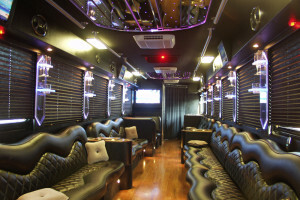 Booking a party bus will also help to ensure the safety of all of your guests. Why risk everyone taking different vehicles when everyone can arrive on time (and in style) in a large, safe bus driven by a professional chauffer? To learn more about a limo bus in Toronto, request a quote from a reputable company such as Majestic Limos.